We have been tinkering around with Windows 8 for a couple of weeks now and while we are still not found of the Metro UI (especially on the desktop) there are things that do make it an appealing operating system. Still there are some things (as there always are) that will cause issues. Back when Microsoft made the move from Windows 98 to Windows 2000 many games did not like the transition to needing a Hardware abstraction layer. Microsoft dropped more than a few patches in the first month to adjust and correct a lot of this. The same thing has pretty much happened since then even with the move from Windows Vista to Windows 7. 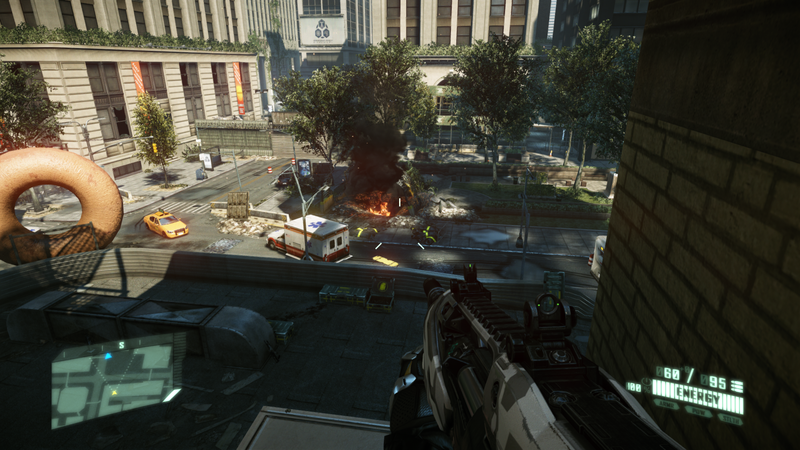 So, how does the early preview of Windows 8 fare in gaming? 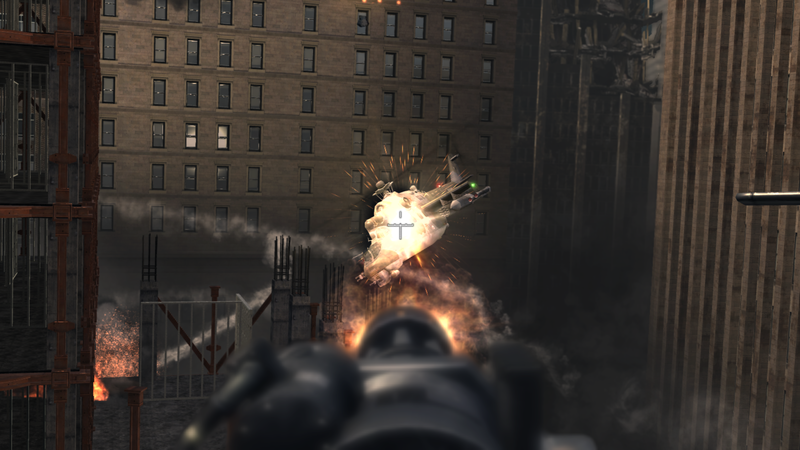 We took seven games and tried them out on Windows 8 to see how they would work. The first thing we had an issue with for Windows 8 on the system we chose was a problem with the audio driver. It did not want to install (it is a Windows 7 driver so we were not really surprised) we did manage to shoehorn it in using compatibility mode though. 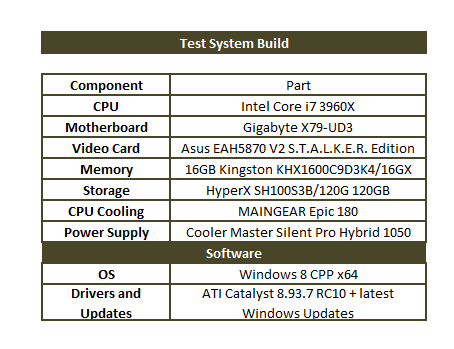 After that things we easy, AMD has Windows 8 drivers for their 58xx series (see the system specs below) so we had no problems with the GPU that we noticed. The games we used were Call of Duty Modern Warfare 3, FarCry2, Crysis 2, The Darkness II, Bioshock 2, Medal of Honor, and Skyrim. With these we had a good selection of games to try out and see what we were going to get out of Windows 8. Once we got things started though we quickly ran into trouble. 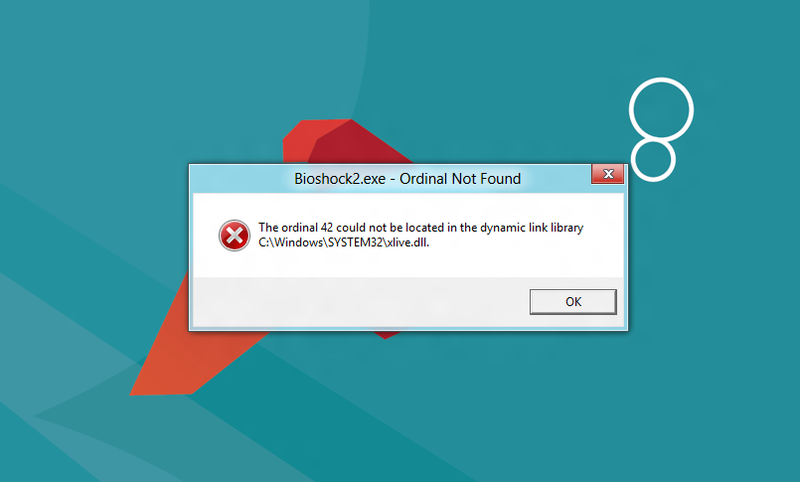 Biosshock would not start at all. The game was looking for Windows Live Games, which is not available in Windows 8. We were not able to find any solutions to this. Microsoft could release patches to fix this (and they really should) or we could end up seeing 2K Games patch this for Windows 8 users. 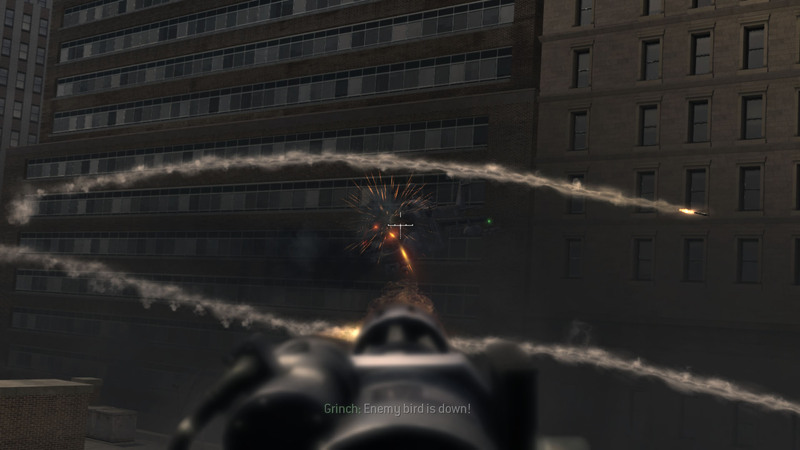 Our next hiccup was with The Darkness II; for whatever reason the game refused to identify the audio card on the X79-UD3. This prevented the audio subsystem from working and while the game was “playable” it was not the full game without the audio. Now our group dropped from 7 to five games. 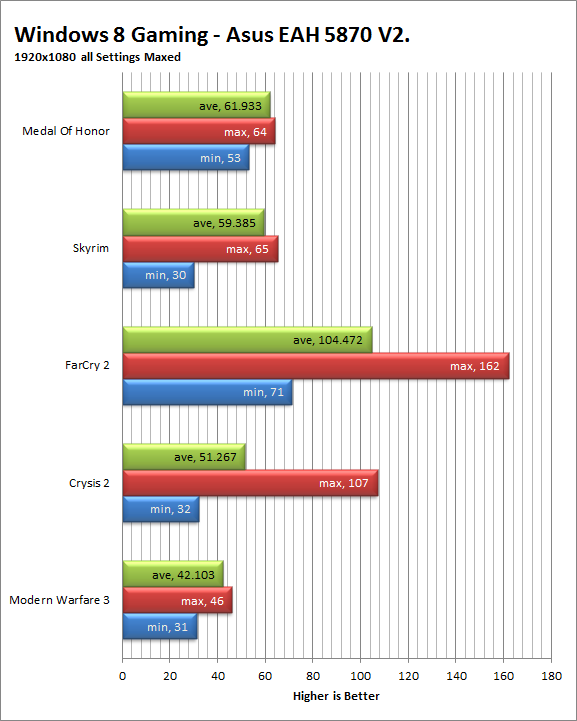 We have the performance numbers below and also have a video we shot of the actual game play on our test system. We will be running the same tests with an nVidia GTX 470 just to see where they are in the driver development stage and hope to have that information to you soon. For now, check out our video coverage of an intro to gaming on Windows 8.